This green marble Waterman pencil with gold-tone trim is a nose drive model from the 1930s. The 4 & 3/4 inch pencil has 1.1 mm lead size, and a washer style ball clip with the Ideal logo on the clip as well as the Waterman name. On the cap is imprinted "Waterman's" and "United States of America," and under the cap is an eraser. The model of this pencil is unknown, but it is linked by its logo to that Waterman stock in trade, the Ideal fountain pen. From 1884, when the first Waterman pen was produced, for the next fifty years, the Ideal fountain pen grew the Waterman company into a large and well-known commercial venture with offices in New York, Boston, and Chicago, and outlets in San Francisco, London, Montreal, and Paris. 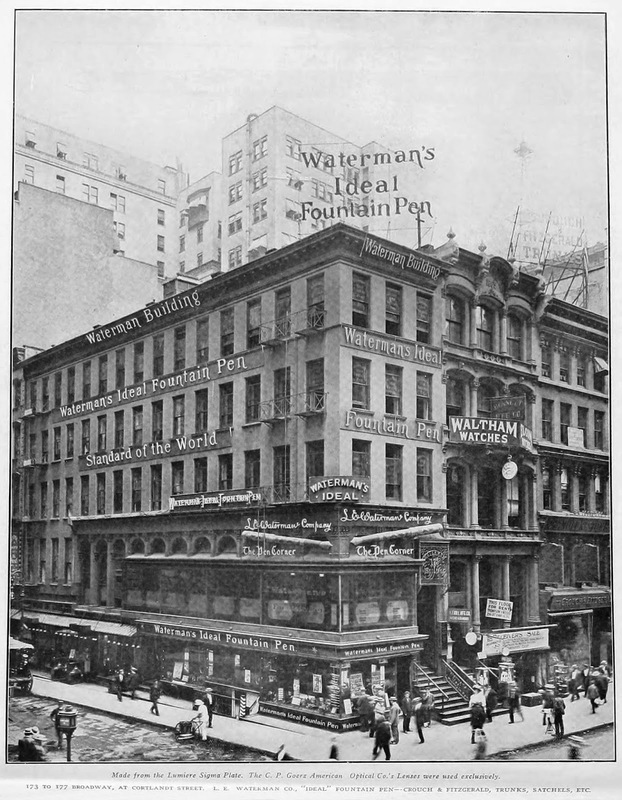 Below is the Waterman building in mid-Manhattan, Numbers 173-177 Broadway, New York. In the 1920s the Waterman company began making pens with emblems on the caps for organizations and fraternities such as the Rotary, the Odd Fellows, the Knights of Columbus, and all branches of the Free Masons including the Blue Lodge, the Scottish Rite, the Knights Templar, and the Mystic Shrine, now known popularly as the Shriners. They also made imprints with lodge names and numbers for individual lodges: the green marble pencil is one of these. This is the imprint of the Free and Accepted Masons' lodge called the Solon Lodge, Number 771. It was a Manhattan lodge of mostly German-American Masons with names like Meisner and Zobel dating back to the 19th century. The lodge belonged to the greater German Masonic Temple Association, and is documented in "A Standard History of Freemasonry in the State of New York." Sadly, the lodge's identity was lost when it merged with Brooklyn's Lessing Lodge # 608 in 1978, and again with the German Union Lodge #54 in 1981. But their pencil outlasted them into the 21st century. After all, it is a Waterman!